(d) Graphene dispersion. (c) Spray coating process. (b) Schematic illustration of the structure of the layered strain sensor. (a) Strain induced resistance change for devices with different sheet resistance. A novel sandwich-like sensor made up of graphene and polymer layers could identify damage and structural changes in materials or the human body, according to Chinese scientists [Liu et al., Composites: Part A 80 (2015) 95]. Strain sensors are ubiquitous in the detection of mechanical deformation, fatigue, and characterization of materials, as well as monitoring activity in the human body. But choosing the right material can be tricky. More robust metal-based strain sensors have relatively low sensitivity, determined by a figure of merit known as the gauge factor, of 2-5. Semiconductor strain sensors exploiting the piezoresistive effect offer much greater sensitivity, with gauge factors of >100, but are more fragile and can withstand only mild strains. Carbon, in form of nanotubes or graphene, presents a very attractive alternative. Graphene in particular could be an ideal option, although it has lower sensitivity than carbon nanotubes, because it is easy to fabricate on a large scale at low cost. 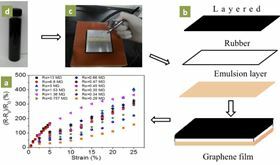 Dong Zhang and colleagues from Tongji University fabricated a strain sensor by depositing polymer and graphene layers onto a stretchable rubber substrate using spray coating. The novel device is highly durable and able to withstand large tensile deformations (up to 25% strain), while possessing low stiffness and tunable sensitivity (gauge factor of 6-35). The team found that the composite devices are more sensitive than pure graphene thin film sensors. Intriguingly, the researchers observed that cracking in the graphene-polymer composite induced by differential rates of shrinkage in two materials appears to play an important role in the strain sensing performance. The sensitivity depends on the resistance in the graphene composite sheet, which can be increased by reducing the graphene density or, in other words, increasing the distance between individual graphene flakes. But the same outcome can be achieved by cracking in the composite film, which similarly serves to reduce the number of conductive paths. “Based on our results, we believe that the introduction of man-made defects (or film cracking) could improve strain sensing performance,” says Zhang. The combination of high durability, high strain endurance, and tunable sensitivity, together with the potential for simple and cheap fabrication, make graphene composite strain sensors ideal for large-scale, low-cost applications. Spray coating from aqueous solution can be used with a variety of different substrates (from concrete to glass, iron, or steel) and complex shapes.